Kimchi, the staple of Korean food, has grown in global popularity to the point dishes made with kimchi including fried rice, stew, and the likes are fast becoming a favorite for many. But lesser known is a dish called kimchi jjim. Jjim is used to describe a sort of "braised" dish with not as much liquid as a soup. One of Seoul's most famed kimchi jjim restaurants is found in the Seodaemun region and goes by the name of Hanokjib Kimchijjim. Located in an old, renovated hanok, this place takes a bit of finding to uncover but nevertheless is quite packed almost always. They carry kimchi jjigae (kimchi stew 8K) but they are probably better known for their kimchi jjim (8K). As mentioned, jjim is a braised dish that generally has less soup than a jjigae (stew). At Hanokjib, they proudly make their own kimchi which are meticulously prepared with some 28 ingredients and left to ferment naturally for long periods so they become extra pungent and sharp. This kind of extra fermented kimchi, called mookeunji, is then combined with big cuts of pork for an addictive jjim. You can also add more meat to your kimchi jjigae (4K for 200g), ramen noodles (1K), tofu (3K) for the jjim they only offer the additional meal however. For a meatier version, you can opt for the kimchi pork spine jjim (large 35K, small 25K). As you know, the hearty gamjatang is also made with pork spine bone so you can think of this as a mix between kimchi jjim and gamjatang. On the side you can order ddeokgalbi (7K) and gyeranmari (7K). As mentioned, the kimchi is the pride and joy of the restaurant here and their ingredients origin list not only lists Korea for all ingredients but specifically which province and city of origin. As the name suggests, the restaurant is located inside a renovated hanok and plenty of seating. Center of every table is a built-in burner so your dish stays hot through your entire meal. Sides are simple, homely standards for a regular kimchi jjigae meal- roasted, salted gim, kimchi, soybean sprouts, and seasoned pickled radish. Funny how eating kimchi jjigae outside always calls for ramen noodles to be added. Interestingly, the kimchi jjim is recommended to be eaten a little differently here. The cooked kimchi head comes out either whole or halved and on the side along with chunks of the braised pork meat separately from the kimchi stew itself. The way they recommend eating is to snip the base of the kimchi head, tear the pork meat into smaller pieces, and then wrap the long strips of kimchi around the pork and eat with the rice. So flavorful and surprisingly moist inside the meat. Gyeranmari (egg roll) is a quintessential part of a nice kimchi jjim meal and the ones here are nice and fluffy and not too oily, not too dry. Tuck that tender morsel of meat within that tart, deep kimchi and let the flavors and textures unfold in your mouth. The soup is nice and pungent as well without being overwhelming. Ramen noodles, egg, or rice, they all make perfect vehicles for that soulful soup. And all for 8K (per person) for this soulful meal. Hungry eaters, eaters with big appetites will probably want to add a gyeranmari side or extra meat but great value nonetheless. Soulful in Korean both inside and out, this is a solid kimchi jjim that should cater well to all whether you're a fan of the soup, the kimchi, or the meat. From exit 3 of Seodaemun station walk out and you'll see in front of you a pedestrian crosswalk crossing over the big Tongil-ro street. Cross to the other side and turn right, walking up Tongil-ro for about 100 meters. When you get to Tongil-ro 9 an gil, turn left into it and walk about 40 meters until you get to a fourway intersection. You should see Hanokjib Kimchijjim on your left. Parking is available in a side building nearby. Beer, soju, most standard Korean liquors available. 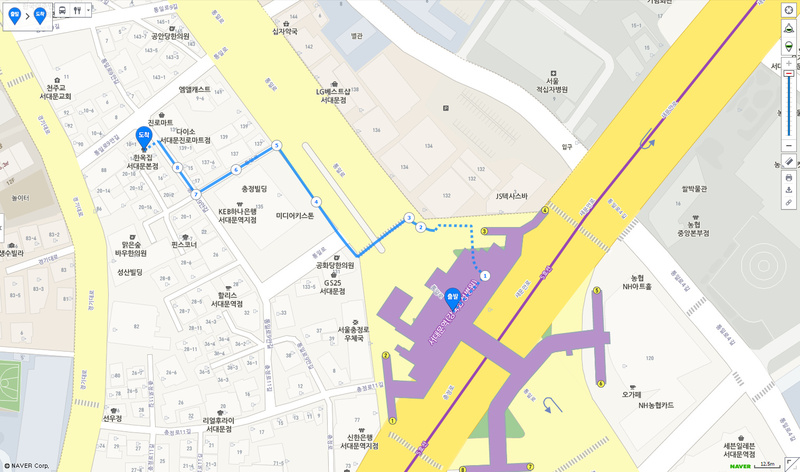 The Seodaemun store is the main store but branches are found around the city including Gangnam's Nonhyeon area, Central City (inside the Express Bus Terminal), near Konkuk University station, and more.